Today’s handmade outfit was unabashedly inspired by this photo from Charlie. After seeing it on Instagram, I just couldn’t get it out of my head. I wanted to wear that outfit everyday and my wardrobe did not supply the garments. So with some fabric, thread and a little bit of sweat, I now have my very own camisole + wide legged pant outfit. Just like Charlie, I used the Ogden Cami pattern by True Bias for the top. I made it twice before and wrote about it here. It’s a really easy and satisfying pattern to make. One of my other Ogden Camis was feeling a little tight in the bust so I cut this one about 1/4 inch larger at the side seams. The fit is just perfect. The fabric is a crepe de chine that I bought from Imagine Gnats. It's been in my stash for almost exactly two years! I was initially planning to make the Colette Aster blouse but was nervous about the fabric being too fiddly for a blouse with a button band. Using it to make a camisole was a much better idea. So much simpler and it has the perfect drape. I love the print on the fabric and it is really nice and soft too. I was initially thinking about making a dress out of this fabric. I posted about my ponderings on IG and the overwhelming advice was to make a dress. But I only had 1.5 yards and I have lots of dresses so I decided to make the camisole. I wore it for the Fourth of July (hello white + blue!) and am hoping to get more use out of it this summer. For the pants, I used the Flint Pants pattern by Megan Nielsen. 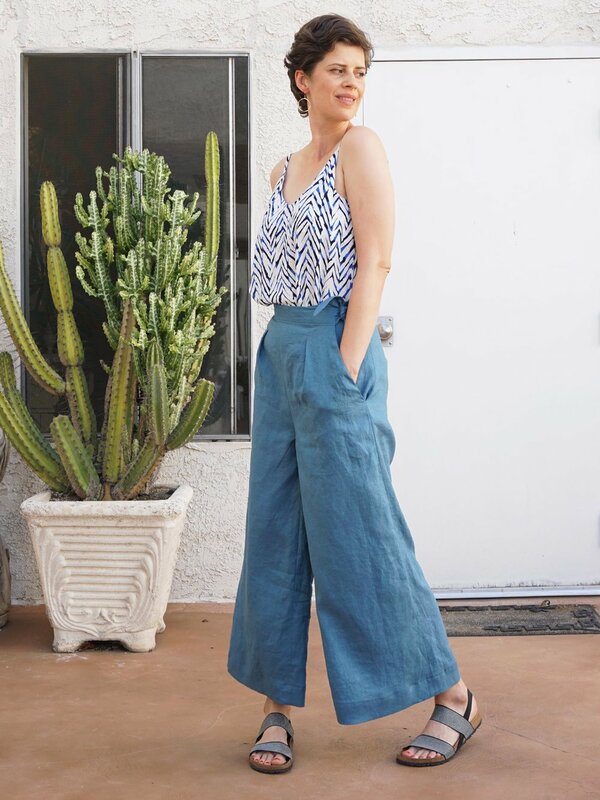 I love the design of these pants–high waist, wide leg and a tie waist. The design is perfect for LA weather, shorts for super hot days and breezy pants for the rest of the year. I started out by making a wearable muslin in a shorts length (seen on Instagram here). I used the same crotch adjustment that I used for my Tania Culottes a few years ago (seen here and here). One of the great things about making multiple patterns by the same designer is that you can repeat your pattern adjustments with confidence that they’ll likely work out. Just like the Tania’s (which I’ve been intending to make again), I dropped the crotch 1.75 inch. Because Flint and Tania both have a wide leg, I just scooped a curved wedge out of the crotch instead of lengthening the pattern in that area. I cut between a size S and M and I’m really pleased with the fit. Last year I made the Brumby Skirt and made a size M. Now I really wish it was a little smaller at the waist. The tie waist is a little forgiving as far as sizing. Just tighten or loosen and you’ll be able to adjust the fit a little bit. The shorts fit great although they are a little short. I had to make a very narrow hem. If I make them again, I’ll lengthen them a couple inches so that I can have a longer hem. For these pants, I added 4” to the length of the leg and made a 2.5 inch hem. I like where they sit on my legs but am curious how they would look cropped to just below the calf and above the ankle. The construction was really easy (which I think it is also fun :). Megan’s instructions and illustrations are very easy to follow and I never find myself getting confused or frustrated. The only tricky part is perfectly placing the ties so that they are in the right location when you fold the waistband. I recommend lots of basting to make sure you get everything in just the right place. I’m very happy with both of these makes. They were really fun to make and I’m perfectly pleased with the fit of both pieces. I’m hoping to get a lot of wear out of these this summer. They are both light weight and not too tight for maximum cooling. I’m also wanting to make more dresses this summer but feeling a little uninspired for a design. What are you sewing this summer?